Get certified in the UMC Program at Water U. 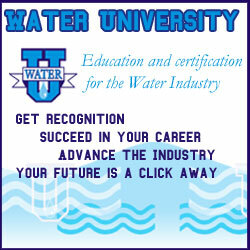 To learn more about Water University, visit the national website at wateruniversity.org. The “Utility Management Certification” (UMC) program is designed to recognize the professional educational achievements of individuals and to market their achievements and skills to increase the value of today's utility manager. Whether you are currently a manager or in an entry level position, the “UMC” designation will enhance your career opportunities and document your field of study as the demand for qualified management personnel increases. Application. Open the PDF application form. You may complete and send it online or save a copy to your computer system to complete and send later. Once complete, send it to our office for review, approval and forwarding to NRWA. - Use the "Submit Form by Email" button on the application to automatically email it to our office. - Or send the application as an email attachment to arwaservices@alruralwater.com. Note: We prefer the email version of the application for forwarding to NRWA, but if email is not available, you can send it to us by fax or regular mail. Study Guide. Once you submit your application, it's time to start preparing for the test. We recommend you purchase a study guide to prepare for the examination. Study Guides may be ordered from us on the order page. They cost $55 each (volume orders receive discounts). Certification Exam. Once we have reviewed and approved your application, we will send information to you on how to pay the $250 exam fee and schedule your test. Note: The application and exam fee of $250 and must be received prior to authorization for testing. On passing your exam, you will receive the Utility Management Certification and national recognition for this achievement.